The vast majority of apps are discovered by using the search function in the App Store or Google Play. To utilize this fact one has to find relevant keywords with a decent traffic and low competition. Let’s see how you can do this. 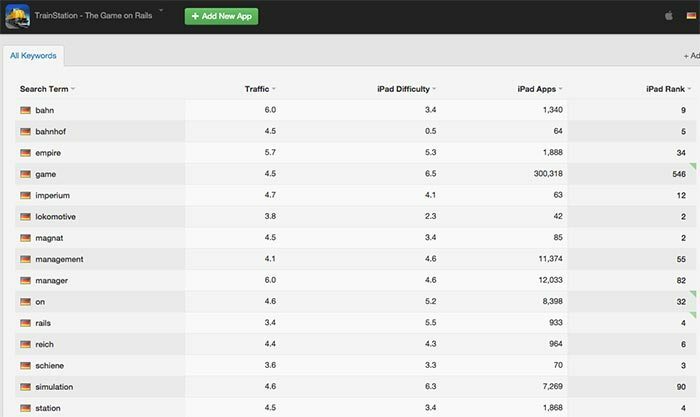 First of all, if you are not familiar with a term App Store Optimization, read this article first and then come back. 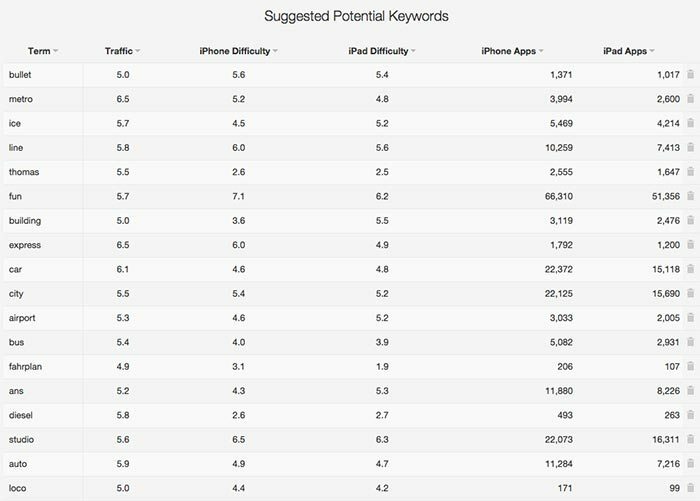 Whilst understanding ASO is quite easy, going deeper to keywords can be a little bit tricky without previous knowledge. During the brainstorming process your main goal will be to find prospective keywords not only in terms of traffic but also relevancy, difficulty and possibly global trends. You need to dig deeper into people’s minds and understand how they search and what they are looking for. There are various tools and ways to brainstorm specific keywords, let’s take a look at them. Well, obviously. If you have a direct competitor there is a good chance they already went through this process and you can learn a lot just by looking at their keywords. My precious tool for doing this is called Sensor Tower and the basic version is free of charge. Write them down to your new Excel sheet full of shiny prospective keywords. For now, ignore traffic and difficulty columns – we will evaluate all our keywords later. Another cool feature in Sensor Tower is called Keyword Suggestions. Just choose an app (doesn’t matter whether it’s yours or not) and you will see a long list of similar keywords that could possibly fit your needs. Again, write them down. There is much more in Sensor Tower so be sure to experiment and play around for a while. Keyword Planner was created for advertisers on Google AdWords platform; however, it could be really handy in the App Store Optimization process as well. It’s also completely free since all you need is a Google account in conjunction with AdWords account. You can create one here. In Keyword Planner, choose “Search for new keyword and ad group ideas” and fill the input fields. Shortly describe your product (for example “note taking app”) and enter your webpage. If you don’t have any website, feel free to use someone else’s – in our case Evernote’s. Ignore the category field and just proceed further. Click “Get Ideas” and on the next page just navigate yourself to “Keyword Ideas” tab. Once again, experiment for a while and then start taking notes about your prospective keywords. Another handful and in my opinion underestimated tool is called Google Trends. 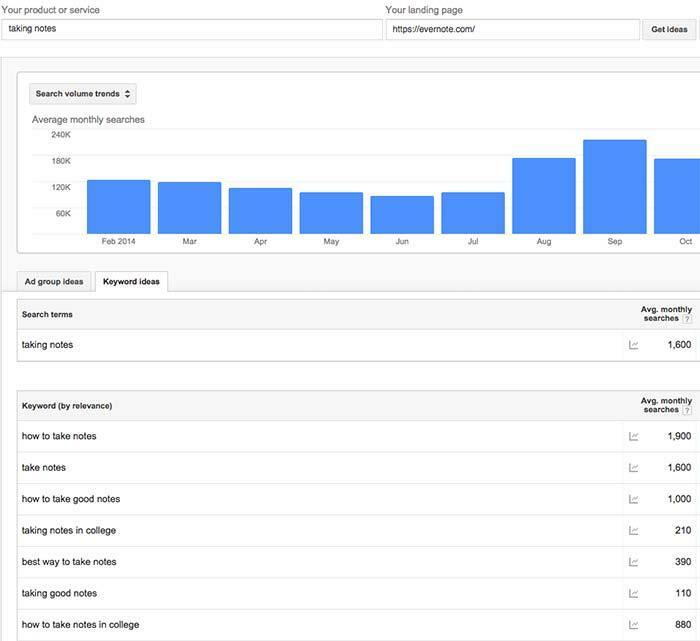 It’s more a statistics overview than actual keyword investigation tool but it could be used for further understanding of people’s search behaviour and the most importantly, for predicting a future demand. One can use Google Trends to either widen his pool of targeting search phrases or to choose new world regions with a particular interest in his niche so he can localize keywords to reach the local audience. Whether you’re on the App Store or Google Play, user reviews are relatively accurate way to understand how users think about a particular app. People usually use specific keywords when they talk about yours or competitor’s product and you can take advantage of this. You can either do the analysis yourself or use various ASO tools with this functionality. For example App Annie allows you to export all reviews into a well-arranged CSV file. I also highly recommend using a localized version of Thesaurus if you want to translate your keywords by yourself and you’re not a native speaker for that particular language. Now as we have plenty of keywords in our Excel sheet it’s time to evaluate them and choose the most prospective ones. We will take a look at this process in another article coming next week. Don’t miss it and be sure to subscribe below.